Gastric bypass and other weight-loss surgeries make changes to your digestive system to help you lose weight by limiting how much you can eat or by reducing the absorption of nutrients, or both. Gastric bypass and other weight-loss surgeries are done when diet and exercise haven’t worked or when you have serious health problems because of your weight. There are many types of weight-loss surgery, known collectively as bariatric surgery. Gastric bypass is one of the most common types of bariatric surgery in the United States. Many surgeons prefer gastric bypass surgery because it generally has fewer complications than do other weight-loss surgeries. Making the decision to have gastric bypass surgery requires that you know what you’re getting into. Yes, you’ll lose weight, and there are lots of potential benefits beyond that. But there are also some serious risks. And some very unpleasant side effects. Overall, about 5% of gastric bypass surgery patients experience some kind of complication. 10% experience some kind of problem that requires attention from the doctor or nurse. 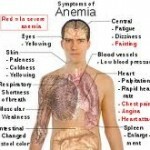 Nearly everyone experiences some of the unpleasant side effects also listed here. No one can predict whether or not you’ll suffer from any of these complications. Even the rare ones do happen to somebody. And that somebody could be you. So just be aware. Understand that this is a very big deal before you sign up for it. Knowing what the potential dangers are, and being prepared for the possibility, will make you that much more likely to be successful should you decide to go ahead and have gastric bypass surgery. Excess weight places extra stress on the chest cavity and lungs, resulting in a greater risk of pneumonia after bariatric surgery. Blood clots in the legs (venous thrombosis) are another possible postoperative problem. This risk can best be reduced by exercising the leg muscles to promote blood flow. Walking is the ideal exercise, although even moving the feet and ankles up and down while lying in bed helps. 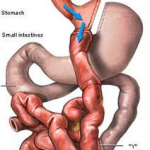 Incision infections, sometimes serious, can occasionally occur following bariatric surgery. 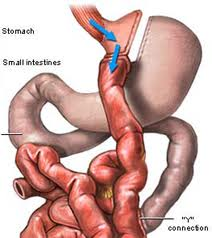 Minimally invasive (laparoscopic) bariatric surgery reduces the chance of incision infection. 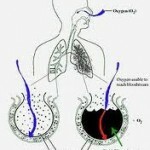 A leak at one of the staple lines in the stomach is a slight possibility. Most leaks are treated nonsurgically with drainage and antibiotics and heal with time. Occasionally, a very serious leak requires emergency surgery. An uncommon complication of gastric bypass surgery is an ulcer developing where the small intestine attaches to the upper part of the stomach. Ulcers are more likely to develop in people who take aspirin or nonsteroidal anti-inflammatory agents. A hernia or weakness in the incision sometimes occurs and needs to be repaired. Hernias are less common after laparoscopic surgery. A narrowing or stricture of the opening (stoma) between the stomach and intestine is a rare complication that can occur. Fixing this complication may require another surgery. More commonly, an outpatient procedure can expand the narrowed area with a dilating tube passed to the stomach through the mouth. After weight-reduction surgery, the body may not absorb certain vitamins and minerals. Follow-up visits with your physician will determine which vitamin and mineral supplements are necessary after surgery. Dehydration is a possible complication following weight-reduction surgery, as patients are no longer able to drink large quantities of liquid at one time. 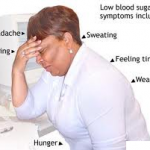 Doctors have recognized and reported on a seemingly rare but serious complication following gastric bypass called non-insulinoma pancreatogenous hypoglycemia syndrome (NIPHS) or post-bariatric surgery hypoglycemia. After a person eats, this condition can result in very low blood sugar levels that lead to severe neurologic symptoms, including visual disturbances, confusion and (rarely) seizures. Doctors have evaluated and treated several patients with NIPHS. When medical and diet therapies do not work, surgical removal of part of the pancreas has resulted in marked improvement of symptoms for most patients. If the symptoms described above occur, patients should notify their physician immediately. Until this condition is controlled, patients should avoid driving motorized vehicles or performing tasks that could affect the safety of those around them. This entry was posted in Weight Loss and tagged bariatric surgery, digestive system, gastric bypass surgery, infection, lose weight, non steroidal antiinflammatory agent, pneumonia, ulcer, venous thrombosis, weight loss surgery on February 19, 2012 by alwin.